What else does this guy know? According to a report published by the Aviation Safety Network, commercial airlines recorded zero deaths on passenger jets in the year 2017, topping off an excellent travel record that has sustained in the U.S. for a decade. As soon as the report circulated the news cycle, President Trump took to Twitter and claimed credit for the record year of aviation safety. “Since taking office I have been very strict on Commercial Aviation. 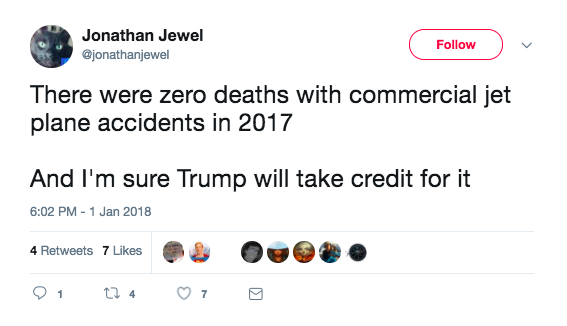 Good news – it was just reported that there were Zero deaths in 2017, the best and safest year on record!” Trump tweeted on Tuesday morning. What Trump did to deserve these self-imposed accolades is anyone’s guess, considering that his administration’s attempts to privatize air traffic control stalled in Congress this summer. White House spokesman Raj Shah attempted to explain the tweet, saying Trump “raised the bar for our nation’s aviation safety and security” — whatever that means. Admittedly, I didn’t see that coming.